1. Combine the ingredients for the Stir Fry Sauce. Set aside in a small dish. 2. Bring 4-5 cups of water to boil in a small pot or sauce pan. Once the water is boiling add the asparagus and boil for 3-4 minutes. Once it's done drain and rinse and set aside. Start cooking the rice. Put 2 cups of rice and 4 cups of water in a pot. Bring it to a boil then cover and turn down to low heat. Cook for 15 minutes. After the 15 minutes remove from heat and fluff with a fork. 3. Add 1 tablespoon of vegetable oil to a wok and place over high heat. When the oil is heated add the asparagus. Stir fry for 3 minutes or until the asparagus starts to turn golden on the edges. Remove the asparagus and add another tablespoon of oil. Add the beef, you may need to fry half at a time. Fry the beef for about 2 minutes stirring constantly. The beef won't be fully cooked, it should have quite a bit of red still. Add the bell pepper, stir fry mix and chinese pepper, stirring constantly for about 1 minute. Add the cornstarch and cook for two more minutes or until the sauce thickens up. Next add the asparagus and bamboo shoots. Toss together for about 2 minutes. 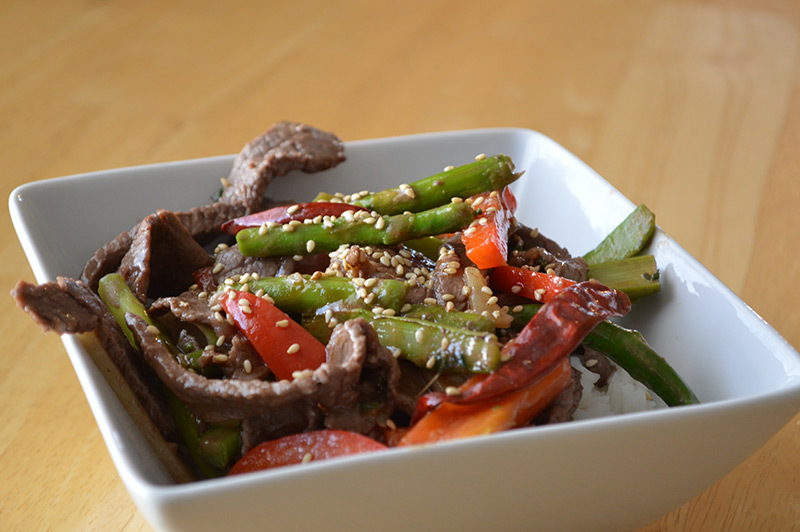 This Beef and Asparagus Stir Fryrecipe come from China and is easy and tasty. As with most stir fry recipes, one of the keys to success is cooking everything on high heat. A wok is very helpful to get it right but if you don’t have one you can make do with a frying pan as long as it has high sides. One of the great things about stir fry is the near limitless combinations you can put together and have it come out tasting awesome. If you use the stir fry sauce included in this recipe then you have a strong foundation to use when making up your own recipes. If you like your food a little more spicy you can add hot sauce to the recipe, adding it to the wok right at the end, just make sure your face isn’t over the wok when you add any spicy liquid or you’ll risk burning your nose, eyes, and throat with the steam from the sauce.